GT Automotive gives you the most value for your Honda auto repair dollar. When it comes to Honda timing belt replacement in Salt Lake City, we maximize your auto repair investment of labor costs. In a Honda timing belt service, for example, we will save you on total labor costs that involve items like the water pump, front engine seals, drive belt, idlers, and tensioners, along with the timing belt. Seth at GT Automotive in South Jordan, Utah shares in this Honda car repair video the value we deliver in your Honda timing belt repair. Many Honda engines are interference engines. They do this because they are looking to get a little more performance out of their high compression, small engine design. In an interference engine the valve opens further into the combustion chamber than a non-interference engine. So, if the timing belt breaks (because of age, or due to the water pump or some other component failure), both the piston (and the valve it strikes), can and will be damaged. Damage of this nature will result in either major and costly repair, or (worst case) a complete engine replacement. A malfunctioning water pump can cause the belt to break, which can cause the piston to strike and damage the valve, which results in major engine repair and major dollar signs. Since the water pump is driven by the timing belt, if you don’t replace the pump now, and if it starts leaking later, you will wind up paying essentially the same labor costs later that you are paying now for timing belt replacement. By getting the water pump replaced at the same time as the timing belt, you will pay little labor cost for the water pump’s replacement. It is a wise decision not to gamble on a worn out water pump. Just get that water pump replacement done at the same time. You save on total labor costs of both timing belt and water pump. Remember, the water pump is already removed to replace the timing belt. So you save on total costs there. The same principle applies to the cam, crank seals, and belt idler pulleys on the Honda. We check your motor mounts during timing belt replacement, since they are easily visible and can be serviced and/or replaced if necessary. That way, we maximize the value of labor costs during Honda timing belt replacement service. GT Automotive can replace your Honda timing belt at the factory recommended mileage intervals. This simple procedure will help to prevent premature engine failure and costly repairs, and can help to ensure that your engine is running efficiently and quietly for a long time. Call 801.302.0912 for Honda service and repair in Salt Lake City from our factory trained Honda and Acura technicians-our Honda techs have over 37 combined years of Honda auto repair expertise. Since 1980, GT Automotive and our ASE certified and factory trained Honda and Acura technicians have been serving Honda car owners in the Salt Lake Valley for all their vehicle repair needs. Call us today, 801-302-0912, about servicing and repairing your Honda or Acura in Salt Lake City. As an update to the record setting June 2014 recall of 31,400,000 vehicles due to air bag deployment issues, Subaru announced this past Monday, July 7, that owners of an additional 8,557 Subaru vehicles would be notified of possible Subaru air bag inflator problems. The Subaru models added to the list are 2003-2004 Legacy, Outback, Baja, Impreza and WRX cars. “Subaru of America, Inc. is conducting a recall of certain model year 2003-2004 Legacy, Outback, and Baja vehicles as well as certain 2004 Impreza (including WRX/STI) vehicles, equipped with Takata-brand front passenger air bag inflators. Upon deployment of the passenger side frontal air bag, excessive internal pressure may cause the inflator to rupture. CONSEQUENCE: In the event of a crash necessitating deployment of the passenger side frontal air bag, the inflator could rupture with metal fragments striking and potentially seriously injuring the vehicle occupants. Subaru will notify owners, and dealers will replace the inflators in all affected vehicles, free of charge. The manufacturer has not yet provided a notification schedule. Owners may contact Subaru at 1-800-782-2783. Subaru’s number for this recall is WQL-48. ILX Hybrid vehicles manufactured October 18, 2013 to February 19, 2014. Since 1980, GT Automotive and our ASE certified and factory trained Honda and Subaru technicians have been serving Honda and Subaru car owners in the Salt Lake Valley for all their vehicle repair needs. Call us today, 801-302-0912, about auto repair in Salt Lake City for your Subaru, Honda or Acura. 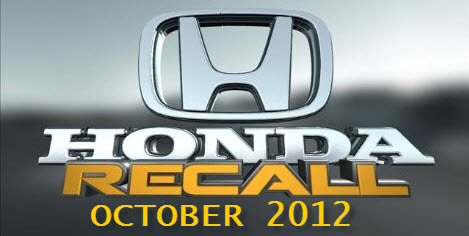 Perennially known for its vehicle quality, safety and consumer confidence, Honda uncharacteristically announced three major vehicle recalls in the first week of October, 2012, for CR-Vs, Accords, Civics and Pilots. 1). 2002-2006 Honda CR-V Electrical Switch Failure. Saturday, October 6, 2012, Honda Motor Co. issued a press release, recalling CR-V crossovers from the 2002 to 2006 model years, because an electrical switch in the driver’s side door that could possibly melt and cause a fire. According to Honda, there have been four reported instances of fires thus far, although no injuries, accidents or crashes have been associated with the fires. The government agency NHTSA (National Highway Traffic Safety Administration) suggested owners should park their CR-Vs from those model years outside-as opposed to inside a garage or other confined space-until the recall is performed, to avoid any property damage from a fire. The NHTSA said a fire could start even when the ignition is off, and the CR-V is parked. The recall covers over 268,000 vehicles. The Honda auto maker said rain or other liquids could enter through a driver’s open window and damage the master power switch on the door. If that happens, the switch could overheat and melt, causing a fire. Due to the overwhelming number of vehicles involved, and the necessary parts needed to complete any needed repairs, the company will begin contacting owners in November, 2012, and will repair the vehicles for free. Honda will begin sending notices in October, 2012 to 573,147 Accord V6 sedan car owners-model years 2003 to 2007-for possible premature deterioration of power steering hoses. A total of over 625,762 Accord and Acura TL models are being notified. In May of 2012, 52,615 Acura TL models (2007 & 2008) were notified of recalls for the same possible power steering hose failure. Now, Honda has added the 2003-2007 Accord V6 models to the recall. What is the problem? The power steering hoses in these vehicles may deteriorate prematurely, causing power steering fluid to leak onto hot parts of the engine. If power steering fluid were to spill onto a hot catalytic converter or a heated exhaust part, for example, it could cause smoke and potentially a fire. Earlier in the week, the company said it was recalling 820,000 Civic compact and Pilot SUVs from the 2002 through 2004 model years because the headlights can fail. CR-Vs were recalled earlier this spring for that same issue. The loss of headlights could limit a driver’s ability to see the road and potential hazards. However, Honda says no crashes or injuries have been reported in connection with this headlight problem. So if you own a 2003-2007 Honda Accord V6, a 2002-06 CR-V, or a 2002-04 Civic or Pilot, Honda will be contacting you shortly. You may contact Honda for further information at 800-999-1009. Customer service will handle live calls from 6:00 am to 5:00 pm (Pacific Time), Monday through Friday.